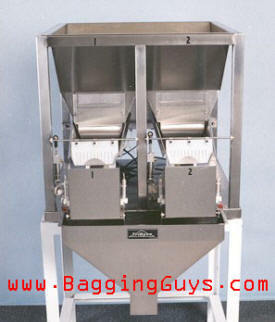 The F-206 Net Weigh Scale quickly "bulk" weighs materials into a collection hopper. When the target weight is approaching, the scale feeder slows down and an automatic cut-off gate reduces product flow into the weigh hopper. When, and not until, the target weight is reached, the feeder stops and the weighed material is discharged into your empty container or bag. The F-206's ability to add multiple lanes allows faster weighing speeds and increased accuracy over single lane models! Multi-lane scales can also be used to blend products based on precise weight ratios or to fill multi-product / multi-cavity trays. Contact BaggingGuys for Access to F-206 Videos & Detailed Photos!